There no immediate reports of deaths or injuries but the force of the waves washed away cars on coastal roads and crashed into buildings along the shore, The Associate Press reported. A second major earthquake of 7.4 magnitude was reported as aftershocks shook the region. The U.S. Geological Survey said the earthquake was magnitude 8.9, which the agency labeled a “mega” quake. 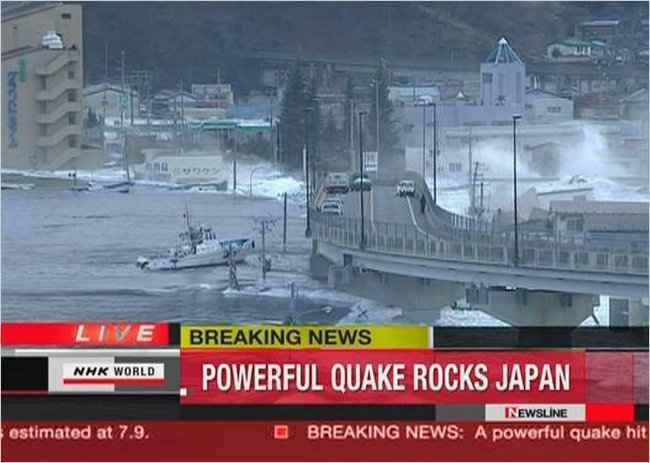 The tremor occurred at about 230 miles northeast of Tokyo and at a depth of about 15 miles. The quake occurred at 2:46 p.m. Tokyo time and its location was off Honshu, Japan’s most populous island. A tsunami warning was in effect for Japan, Russia, Marcus Island and the Northern Marianas, according to the Pacific Tsunami Warning Center. Japan’s meteorological agency warned that a tsunami as high as 20 feet could strike the coast near Miyagi prefecture, closest to the epicenter. 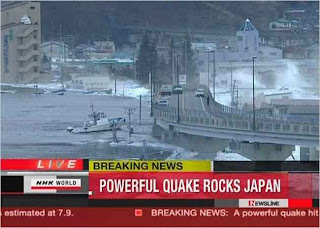 The Associated Press reported that a large ship swept away by the tsunami rammed directly into a breakwater in Kesennuma city in Miyagi prefecture, according to footage on public broadcaster NHK.